Anthony Meier Fine Arts is pleased to announce its upcoming show with New York artist Tony Feher. This will be Feher’s first solo exhibition in San Francisco. 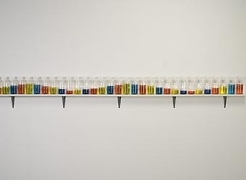 Feher will exhibit new work, which continues his exploration into the world of mass production, consumption and elimination. The artist collects used and discarded goods often found on the streets of New York and transforms them into simple, straightforward sculptures. The materials include plastic bottles, Styrofoam packing blocks, plastic milk cartons, coins, marbles and push pins which are then manipulated in a manner often associated with minimalism. The composition includes serial placement and repetition. The forms are often geometric. A signature piece of which there are many variations is comprised of plastic water bottles gathered together, stripped of their labels and filled to varying degrees with clear or colored water. The bottles are either hanging from a rope so that they are suspended in air or placed on the floor or a shelf. These simple and beautiful water line sculptures become a kind of drawing in space. There are obvious references to minimalism in Feher’s sculpture yet the choice of materials is so banal that it tends to make light of the seriousness often associated with work from the 60’s. Feher is able to draw out the poetic capabilities in the ever-growing detritus that encompasses us. His use of slightly altered devalued materials encourages the viewer to see the intrinsic beauty in things that would usually be considered refuse.